172 pages, 8" x 10"
In Rep, Rips, Reps Weave, author Lucienne Coifman takes weavers beyond the traditional forms and familiar patterns. She provides complete drafts and full instruction for more than 20 of her stunning project designs—rugs, placemats, runners, wall hangings, and samplers. Rep, Rips, Reps is a complete workshop in rep weaving—for both the beginning and advanced weaver. Lucienne shares the proven tips and techniques she has developed through years of teaching. There’s also a photo gallery of games, mazes, and 3-D forms to inspire you to have fun and experiment on your own. Thank you for your support and interest in Lucienne's book! For U.S. sales. please use the Purchase button. For foreign sales, click here. If you wish to purchase in bulk, please send me an email requesting pricing information. Thank you for your order, I hope you enjoy the book and happy weaving! “Take a simple plain weave draft, crowd the warp ends together, use a fine weft and a heavy one—and the result is a sturdy, durable fabric with a look all its own and endless design possibilities. “In Rep, Rips, Reps Weave, Lucienne Coifman explores this weave with clarity and creativity, making it accessible to a novice weaver and intriguing to the more experienced. “From the simplest two-block-on-two-shaft design to the endless variations of eight blocks on eight shafts, the explanations are clear, the hints and know-how helpful, and the projects both handsome and provocative. In English, the technique of rep weaving is known as rep or repp. The word may be a corruption of the word “rib,” which is a characteristic of the fabric. In French, the method is called reps—another possible source of the English term. In Sweden, the technique is called rips. Although historical information is difficult to find, fragments of rep weave fabrics have been found in South America, the Middle East, and North Africa. Bedouin tribes employed the technique, sewing long, narrow, rep weave bands together to make tents, bags, and other items. Central American Indians used rep weave as the foundation fabric for their clothing, on which they hand-embroidered colorful designs. Surprisingly, in Sweden rep weaving is mainly associated with rugs, which are usually woven with only two or three colors. 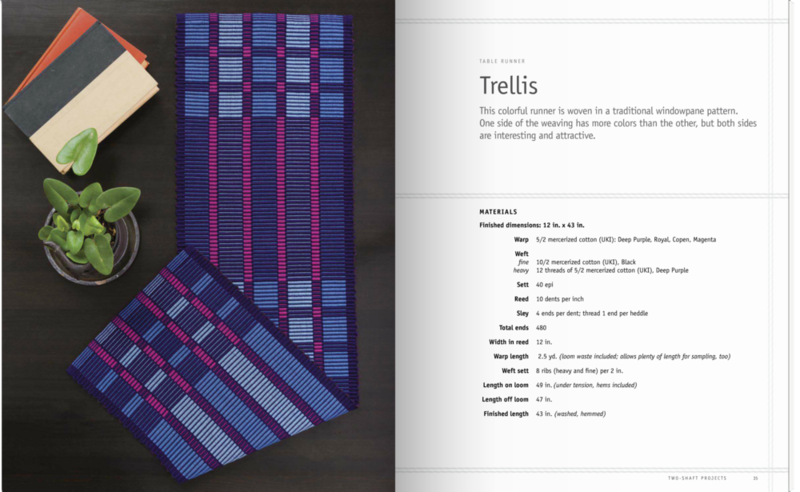 In the early 1980s, weavers in the United States began to discover rep weave through the many Scandinavian books on the subject. By the 1990s, rep weaving grew very popular, and weavers developed more colorful and complicated patterns.